Black Rhino wheels have been built for two types of vehicles. The first is for Trucks or SUVs with an extreme lift. Black Rhino offers wheels built with a negative offset that enhance the aggressive stance that these vehicles demand. The second is for the more street friendly Truck or SUV which has a more positive wheel offset. These wheels can be used on vehicles with a mild lift or stock appearance. 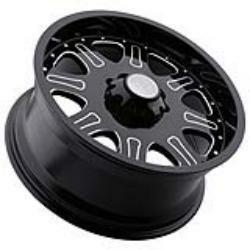 When it comes to choosing well built, tough looking wheels for your off road truck, lifted truck or sport utility vehicle, Black Rhino Wheels has several styles available. Black Rhino offers styles for those who prefer a sleek and performance-inspired design or for those who prefer big, bold styling for their vehicle. Black Rhino also offers two styles of off road truck wheels that have been manufactured using C &C milling technology on the face and holes, the Spinreel and the Borrego. Black Rhino truck wheels are available in a variety of fitments in 17", 18", 20" and 22" wheel sizes. They are available in a variety of finishes; Matte Black, Gloss Black with Machine, Matte Black with Matte Machine and are offered in, 5, 6 and 8 Lug sizes. “If you have a 12 inch lift with dual shocks or if you have an aggressive street truck, Black Rhino has wheels that will fit,” says Terence Scheckter, President of Black Rhino Wheels. Black Rhino truck and off road wheels are engineered to carry the heavy loads often associated with Trucks and SUV's. All wheels are either hub centric or supplied with centering rings to ensure a smooth vibration free ride. “Black Rhino Truck Wheels differentiates themselves from most aftermarket truck wheel manufacturers by building wheels that are hub-centric for their vehicle fitments,” says Terence Scheckter. Black Rhino truck wheels and off road wheels are made to extremely strict quality standards and embody more than 30 years of design experience. "We are very proud of what we have achieved at Black Rhino Wheels," says Terence Scheckter "Our new line of truck and off road wheels have had an excellent response from our customers." Black Rhino wheels are available now. For a dealer near you call 1-800-479-8127, or visit Black Rhino Wheels on the web at http://www.blackrhinowheels.com. The wheels are available through most high-end wheel stores in North America, including Discount Tire Direct at http://www.discounttiredirect.com.